You are celebrating the impending arrival of your baby boy. 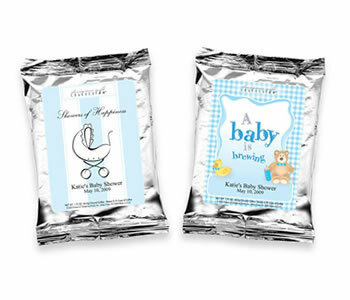 Include the boy themed baby shower coffee favors in your party plan. These unique favors can have your name and the date of the shower printed on one of three different designs. Each package of 1.75 oz premium coffee makes one pot of rich and delicious java, between 8 to 10 cups. With a production time as low as 2 to 6 business days, the boy themed baby shower coffee favors are the perfect addition to his special event.